It just so happens that, as we write this letter to you just after the July 4th holiday, “high, high, high, high” is also the best way to describe the U.S. equity market. All three closely watched indices: the Dow Jones Industrial Average, the S&P 500 and the Nasdaq, are still within 2% of their all-time record high levels. Even international markets have joined the party this year, with the MSCI EAFE index up over 12% so far. This performance has served all of us well as we have enjoyed another year of positive stock market returns. As always though, we are also focused on what lies ahead. There have been a number of factors pushing the markets higher this year, as we wrote to you in our last newsletter in April. Just to refresh your memory, the election of Donald Trump and with it the possibility that his pro-growth policies might be enacted this year, injected elation into the stock market commonly referred to now as the “Trump Bump.” At the same time, data on the economic—and earnings—front early this year also provided a welcome boost. According to data from Zacks, an investment research firm, earnings for the S&P 500 companies collectively rose almost 14% in the first quarter, the highest growth rate in over five years. The percentage of those companies that exceeded Wall Street analysts’ expectations—close to 75%–was also one of the highest in recent memory. Results in Europe and Japan painted a similar picture. The current (second quarter) earnings season in both the U.S. and overseas could continue to provide a boost to equity prices. Although a slower pace of growth is expected in the U.S. (6.6%, according to FactSet), that is still a respectable rate by historical standards. Likewise, in Europe and Japan, an ongoing improvement in economic activity in those regions should support a solid earnings season and stock prices there as well. We note, however, reasons to take pause with the outlook for the second half of the year. The prospect that any facet of Trump’s pro-growth agenda passes, let alone has any kind of positive impact, is fading rapidly. Perhaps that is one reason why the U.S. indices, while still within striking distance of their all –time highs, have in fact exhaled recently. Furthermore, we are watching developments on the economic front closely, as there are some disappointments there as well. According to the Wall Street Journal, economists have been ratcheting down their expectations for U.S. economic growth in the second half of this year—in some cases dropping it to as low as 1.5% in the third quarter from 3.0% in the second quarter. Furthermore, the rapid reversal in both oil and other commodities prices this year are concerning developments and typically are not a good omen for future economic growth. Oil prices, and the corresponding S&P 500 energy sector, are both down about 15% so far this year and many other commodities have sold off meaningfully from their highs earlier this year. Moreover, thanks to Federal Reserve’s policy of raising interest rates, short term rates have moved up much more relative to long term rates. This has caused the yield curve to flatten. Typically it does not bode well for the economy when the yield curve flattens or even worse inverts (short term rates higher than long term rates). Indeed, even though inflation remains stubbornly low and just below the Federal Reserve’s target of 2.0%, the Board is determined to continue to raise interest rates at least one more time this year. Additionally, as disclosed in the release of the minutes from their most recent meeting, the Fed is also exploring a reduction of their balance sheet. We are closely monitoring this reduction in liquidity as the economy continues to slow. As a result, some market observers now say that the Federal Reserve is less concerned with staying ahead of inflation and more focused on having room to lower rates if the current economic expansion fades. The area of concern for us is the lack of broad based participation in the market’s continued march upward recently. In other words, unless you owned in a large percentage a relatively select group of high growth technology companies, you would have been left far behind in this year’s rally. By our calculation, just five stocks: Facebook, Apple, Amazon, Google and Microsoft contributed about one-third of the market’s return so far this year. Looking at it another way, the chart below shows the difference in performance this year between the tech-heavy “growth” stock index, versus the older economy “value” stock index, which has heavy exposure to the financial, industrial and energy sectors. 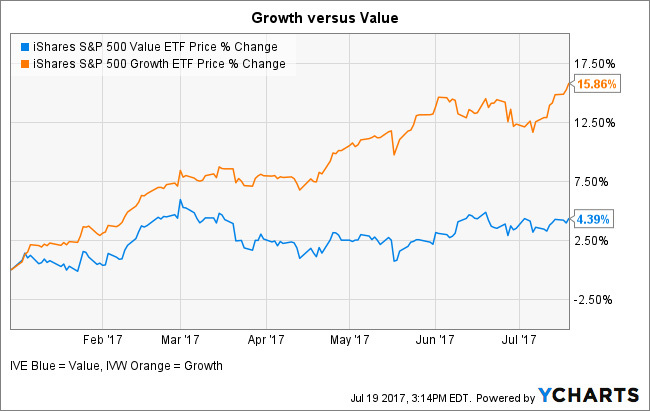 The growth stock index performance has trounced the value index by more than threefold. As we have written in this venue before, we are always focused on helping you achieve your goals and doing so by paying close attention to risk management. To that end, we have maintained our allocation to equities and where necessary, we have broadened our exposure in some cases through the use of low cost index funds to ensure that we participate in the performance of all sectors of the market. The exposure we added to international equities has worked well so far this year for the reasons cited above. Fixed income has produced the kind of stable, if unremarkable, return so far this year that we come to appreciate when times get tough with equities. However, the 2.1% total return on the broadest measure—the U.S. Aggregate Bond Index—belies the fluctuations that have occurred in 2017. Earlier this year, rates across the board—except short term—dropped as inflation expectations ratcheted down. Since then, however, tougher talk from Central Banks, both in the U.S. and Europe about reducing their bond purchases has caused rates to spike higher again. We have not changed our positioning in fixed income since earlier this year as we believe it makes sense to remain conservative from a duration and credit rating standpoint with an asset class that is in place to help manage overall portfolio risk. However, movements in rates can be a clue into what lies ahead on the economic front. Getting back to the summertime, we welcome this year our first ever Cribstone summer interns: Connor Upham and Callen “Cal” Fullerton, who are both working for us in our Brunswick office. Scott’s oldest son, Connor is a newly minted Morse High School graduate who is heading to Dickinson College in Carlyle, Pennsylvania, this coming fall. Cal attends Bowdoin College and is in between his sophomore and junior years. Cal, who originally hails from Princeton, New Jersey but whose parents now live in Harpswell, is studying economics, government and physics and plays lacrosse. Both Connor and Cal have already proven their worth by working on special projects for the Cribstone investment team. It is a pleasure having these two bright young men working with us and we hope you have a chance to meet them. Please contact us with any questions or concerns. Enjoy summertime! Source: Ycharts data analysis January 1, 2017 to present.